I've walked through grief several times in my life. The first time was when I was eight-years-old and suddenly lost my grandpa. I still miss him to this day. Another time was in my mid-twenties when I lost a close friend to Leukemia. I never thought she would die. Recently, I made the walk through grief again. This time was a pregnancy loss. We were expecting our second child. I was due in late April, which happened to coincide precisely with the pregnancy one of my best friends. I was so excited. Having babies at the same time! A new member of the family! Olivia is going to be a big sister! Then I had some spotting. My doctor reassured me that most likely everything was fine. I was 12 weeks, we had seen a strong heartbeat around nine weeks, so miscarriage was statistically unlikely. But, we did an ultrasound for reassurance. As my doctor stared at the ultrasound screen I knew from the slight wrinkle in her eyebrows that something wasn't right. "I'm so sorry," she said, "I don't see a heartbeat." She turned the screen toward me and there was the tiny baby we had seen before, but this time it was still and the fluttering heartbeat was gone. I would never hold in my arms the baby that I had imagined so many times. My heart began to crumble. 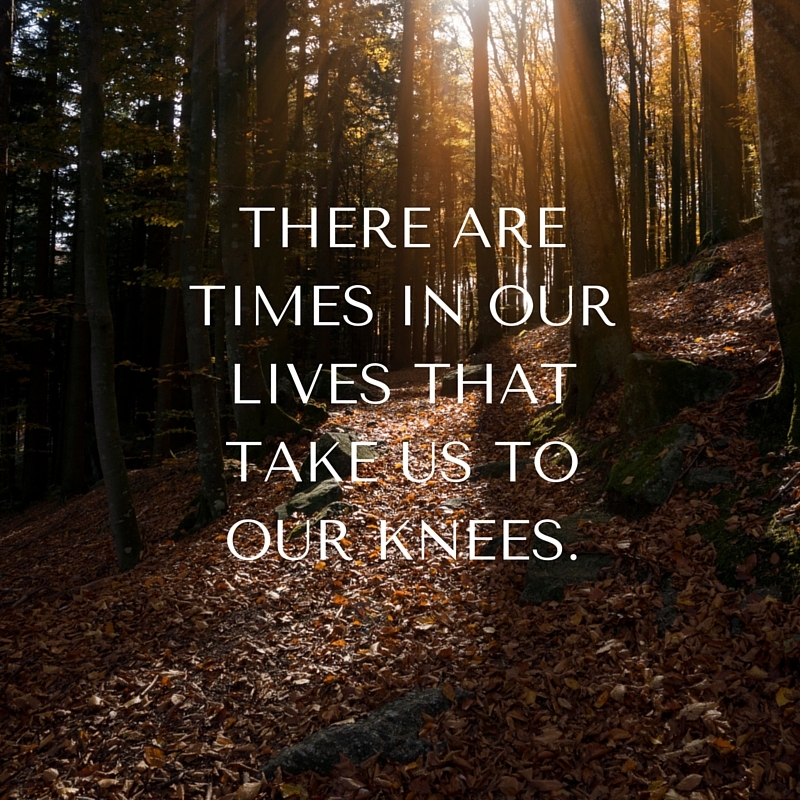 THERE ARE TIMES IN OUR LIVES THAT TAKE US TO OUR KNEES. Grief can show up in many different ways, from a relationship dissolving to the loss of feeling safe and secure. As I walked through my grief I found myself noticing other's pain more and feeling even more compassion. I felt compassion for the aggressive driver who sped around me and believed that getting somewhere faster really mattered. I understood my daughter's sadness when a toy fell in the car that she could not reach. I wept and prayed for the mother, who I only knew by name, that lost her son to suicide. "Somehow when my heart broke, the qualities of natural warmth, qualities like kindness and empathy and appreciation, just spontaneously emerged." Even when I felt lonely, somehow I also felt so connected to other humans that our oneness felt evident. GRIEF FEELS INSANELY CONFUSING, DISORIENTING AND OVERWHELMING, BUT IT ALSO SEEMS TO PRESENT REMINDERS OF PROFOUND TRUTHS. Things that I cared about so much before my loss seemed pointless and truths seemed obvious. Truths about what really matters and what doesn't. Truths about breaking and still being whole. 1) I TRIED TO ALLOW MYSELF TO FEEL whatever it WAS that I WAS feeling. Emotions that need to be felt will wait for us indefinitely. I knew that if I didn't turn toward my grief that it would linger and I would delay the inevitable. I felt sad, angry, regret, lonely, disbelief--sometimes all within an hour. Feeling the range and intensity of emotions sucked. I really didn't want to feel angry, but I chose to allow all emotions to be felt. 2) I ShareD the sacred space. Grief is sacred work. I felt so vulnerable sharing my grief with others. I felt afraid that if I held out my broken heart to another that they might say something that would make it hurt worse. Some people did. But then there were others who held a space for me that was sacred beyond words. I fell apart and they remained present the whole time. I shared details of my experience and they fully listened. I am so grateful that I reached out and allowed them to hold that space for me. 3) I TreatED MY body gently. Grief is physically exhausting. I'm convinced that our bodies physically change when we're grieving and need to be treated gently. I slept a lot. I wrapped myself in blankets. I did gentle walks. I requested hot bowls of soup to eat. I tried to follow my body's cues for what felt nurturing. 4) I TRIED TO notice the quiet presence of peace. I wasn't excepting to feel peace when I sat alone in the doctor's office and started to call my husband. I felt shock and disoriented. Then I started to feel like I wasn't alone in the room. I felt love around me, telling me that everything would be alright. I considered this feeling like my bedrock--so deep inside me that sometimes it felt impossible to access, but I knew it was there. It was hard to find when I felt angry, but then would arise again in compassion for another. I started to consciously try to notice it when I was doing simple tasks, like emptying the dishwasher, and then look for it again when a wave of emotion would return. 5) I REMINDED MYSELF not to judge MY grief (or someone else's). This was hard. My husband and I both lost an unborn child, but our reactions to the loss and the way we approached our own grief were extremely different. The depth of grief and the way we process our grief can be very different for everyone. I received many helpful reminders to not minimize my grief or the trauma. I reminded myself that new grief can trigger unfinished grief from ages ago, and tried to allow that too. I also shared the thoughts of judgement I had for myself and others with my dear friends who held the sacred space. The act of sharing, along with their wise support, helped me move away from judgements and back to compassion. The walk through grief may feel dark and endless. If you are in the middle of your walk and feel like you can't take another step, reach out for help. Grief counselors and support groups can be profoundly healing.